Here’s the (basically) finished model, and this picture really shows how effective the “Future Shine” wash was – all the brown shading is from that wash.
Also, I’m not very experienced with decals, and those came out great, too! The new Eldar Harlequins are amazing models, and (despite their very dynamic poses) there’s even some room for conversion! To make this Harlequin Troupe Master (who I have named “The Fellow of Infinite Jest”), I used one of the decorative Harlequins from the Starweaver kit (why add decorative minis when you can use them for awesome conversions?). I bent his back leg just a bit to give him more of a dynamic pose and glued his front foot to a tiny ruin bit from the Eldar Wraithlord kit. It worked out perfectly! For his arms, I had to do a little cutting. In the Troupe kit, each figure’s shoulderpads are attached to their body. But, in the Starweaver kit, the figures shoulderpads are on the arms… but those arms aren’t holding the proper weapons to turn the figure into a Troupe Player! A simple cut at the elbows of all the arms allowed me to easily give the Troupe Master a shuriken pistol (actually, it’s a Dark Eldar pistol, but it looks close enough) and the Harlequin’s Caress glove weapon. A true Harlequin never has both feet on the ground! Painting the Harlequin Motley is pretty insane, as you might imagine. My diamond pattern came out great! …eventually. It took many tries, and many paint-overs, and there might be a touch of chunkiness to the lines as a result… but it looks great from “table distance” (that is, when your eyes are one or two feet away, not looking really close or, say, view a picture taken with the macro setting on the camera). It was my first time doing anything like the Harlequin motley, so I’m pretty darn happy about it. I haven’t mentioned this on the blog yet, but 2015 is the Year of Painting. It’s kind of like a New Year’s Resolution, if I made New Year’s Resolutions. Regardless, in my seven or eight years in this hobby, I’ve accumulated quite a few models. I have not, however, painted most of these models. Most of this comes from a huge wishy-washy quality my mind has – I agonize over details like color schemes and whether my painting skill is up to snuff. Naturally, I don’t improve without practice, and thus the vicious cycle continues. Now I’m just chugging through, slapping acrylics over primers over plastics willy-nilly, firing off my airbrush despite a lack of experience with it, and generally just trying to have a good time. Our next installment is some tyranids – I did some hormagaunts to test a color scheme, and threw that on my hodgepodge Swarmlord. The tyranids were just primed white, then the armor plates were coated brown. I washed the white parts with a sepia wash, and the brown parts with a crimson wash, and then I did some highlights, the eyes, etc. The Swarmlord is built out of leftover parts – I sculpted a cruddy body, and then tried to cover up my shoddy work with nicely-made green stuff “hoses” (made with the Tentacle Maker) that are meant to look like carapace structures. No idea how they look to others, but I think their generic, xenomorphic appearance works just great. The fluff piece in my head for this “Swarmlord” is that he survived a disease attack from a Nurgle daemon or cultist, but survived and is now more powerful as a result. Naturally, he just counts as the Swarmlord, but I do like making up stories. I have a rule – Grey Knights wear helmets! Firstly, their helmets look awesome. Second, without helmets, Grey Knights are apparently really goofy-looking hooded guys. I do like the Space Marine Terminator Librarian model (which is the model suggested by the codex as the Grey Knight Librarian as well), but obviously his head is bare… which is not allowed in my Grey Knight army. 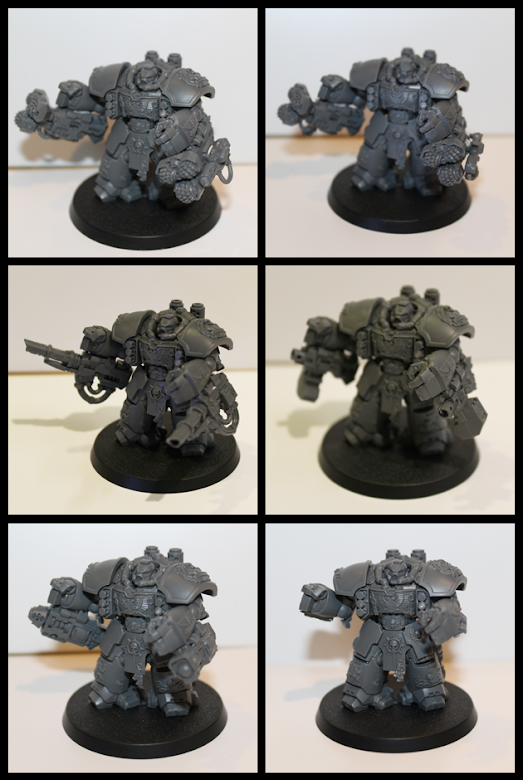 Plus, he lacks the cool wrist-mounted storm bolter that all Grey Knights get standard issue on Titan, and he needed a little more “Grey Knight” decor to make him fit – why not the decorative besagews that are signature pieces of Grey Knight armor? You know, the besagew. The piece of armor that protects the arteries inside the armpit. It’s a real thing. Wikipedia knows about it. Here’s a close-up. Can you tell he’s casting Invisibility? It’s true – he’s a douchebag. This picture makes it look like his head is low and protruding, but it looks right from pretty much every other angle. Here’s a close-up to show the storm bolter. I had to add a spacer (a tiny bit of plasticard) to make it fit properly around his outstretched hand, but I love that hand and I wanted to maintain its effect. Here you can also see the decorative BESAGEW. Now I need to base him, which will give me a chance to show how I have started making custom base stamps to make matching patterned bases customized to each army! Hooray! When last we visited my modified YT-1300 (now dubbed “The Balmorra Ray”) for the X-Wing Miniatures game, I had finished removing the original cockpit and creating a new one. Since then, I cleaned it up, primed it, then cleaned it up some more, then primed it again… and now, finally, I’ve painted it! Bottom view. This looks so neat. Then I edged off the splatter of the airbrushed red, did some dark washes and some brown washes, put on some black, and highlighted the bridge area. I also painted in a windshield. Here are the pics! The finished “Balmorra Ray” (which is the name I gave the ship, because a ship needs a name)! And the bottom, which came out mostly darker. I’m fine with that. The highlighting is a little brighter than I wanted, but I’m going to leave it be. The flash on the camera makes the highlights and shadows more pronounced than natural lighting, so I think it actually looks much better in person than in the photos. I’m very happy with how this turned out, including little details like the clear plastic connector still being clear. I do need to color in the engine (right now, it’s primer gray), and then I desperately need to put a clear coat on it, because the paint on this rubs off way too easily (and I don’t know why). Thanks for checking it out! More to come!